Mac devices are targeted by various forms of malware and other cyber threat, just like Windows devices. As a result, reliable Mac antivirus protection is relevant. This article will review two antivirus suites for Macs, Bitdefender Antivirus for Man and Sophos Antivirus for Mac Free Edition. Check out the article and choose which one is better for you! Bitdefender Antivirus for Mac delivers an award-winning protection for Macs. Bitdefender is a Romanian-based cybersecurity and antivirus provider that focuses on providing advanced security and antivirus products for businesses and individual users. The company was established in 2001 and successfully operates the market. Today Bitdefender protects more than 500 million its customers in over 150 countries worldwide. Bitdefender Antivirus for Mac is one of the most recommended security suites for Macs because it provides advanced antivirus protection and flawless protection against ransomware. Bitdefender Antivirus for Mac starts at $39.99 for one device per year; for $59.99 it can protect up to three Macs. Bitdefender Antivirus for Mac uses a signature-based malware detection to detect widespread malware and behavioral-pattern recognition to detect zero-day malware. All suspicious files are sent to the company’s cloud-based servers for further analysis. It is worth to mention that Bitdefender Antivirus for Mac also blocks Windows malware and prevents it from spreading. According to AV-TEST, Bitdefender demonstrated superior malware detection and found all the malware samples installed on the test computer. 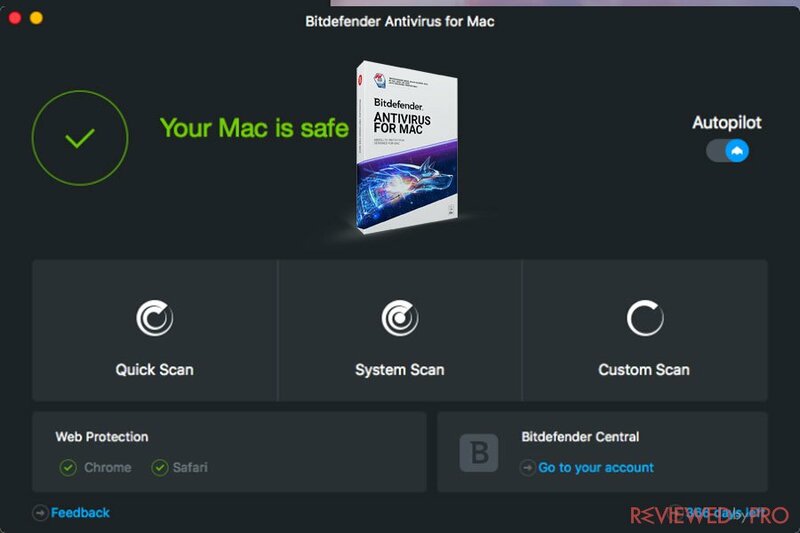 Bitdefender Antivirus for Mac includes a very decent security and privacy feature set together with a brand new advanced ransomware protection – Safe Files and Time Machine backups. In addition, Bitdefender Antivirus for Mac also includes a free browser extension called TrafficLight, which protects and warns users against phishing and dangerous sites. When it comes to a system-performance impact, Bitdefender Antivirus for Mac has a mediocre. While working in the background, the antivirus hits system by almost 3%, and during the full system scan, it hits by almost 8%. Bitdefender Antivirus for Mac has a very simple user interface as all the features can be accessed from the main window. The design looks modern and clear. Researchers at Reviewed by Pro after testing the software provided the final verdict. Bitdefender Antivirus for Mac has a perfect malware detection and removal rates. In addition, it offers advanced ransomware-defenses and parental controls. The user interface is also very pleasant and modern looking. However, when it comes to system-performance impact, Bitdefender noticeably slows down a system and has one of the highest passive system impact compared to its competitors. Sophos Antivirus for Mac Home Edition is developed by a British-based company Sophos Group Plc that focuses on providing award-winning cybersecurity software and hardware. Sophos offers businesses and individual customers security and privacy products and services, next-gen protection, mobile security and management, endpoint protection. Sophos Antivirus for Mac Home Edition is completely free and comes in a single bundle for Mac and Windows PCs. This security suite covers up to 10 devices’ protection, includes remote management and parental controls. The software would be a great solution for those who look for free antivirus system for their Macs and Windows PCs. 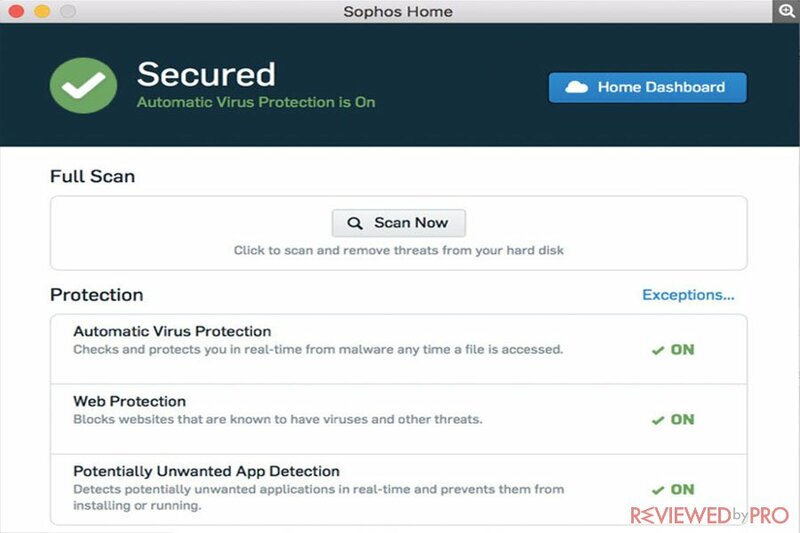 Sophos Antivirus for Mac Home Edition provides multilayered protection in order to catch both, known and unknown malware samples. The protections start with a traditional signature-based identification, then comes heuristic behavioral-based monitoring in order to detect zero-day malware. Sophos Antivirus for Mac Family Edition also scans computers and connections for vulnerabilities and exploits. An independent German lab AV-TEST tested the software and indicated that the detection score is decent, however, it is far behind from Bitdefender Antivirus for Mac. As a free product, Sophos Antivirus for Mac Home Edition offers a very decent set of security and privacy features. The security suite includes remote management, real-time antivirus, web protection and parental controls. In addition, if you want to try Premium feature, you can try it for free for 30 days. Sophos Antivirus for Mac Home Edition has a mediocre performance hit while working in a background. Users also can notice some system slowdowns during scans. 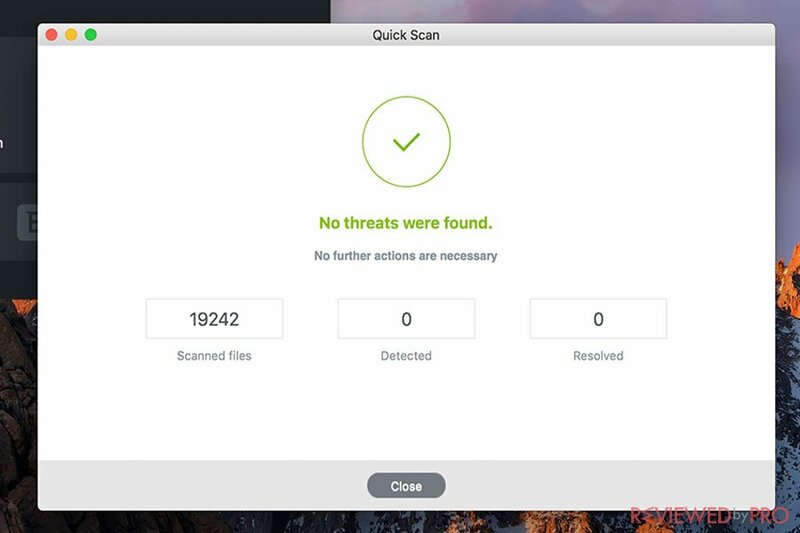 The full scan takes an average 40 minutes, which is a bit slower compared to Bitdefender Antivirus for Mac. 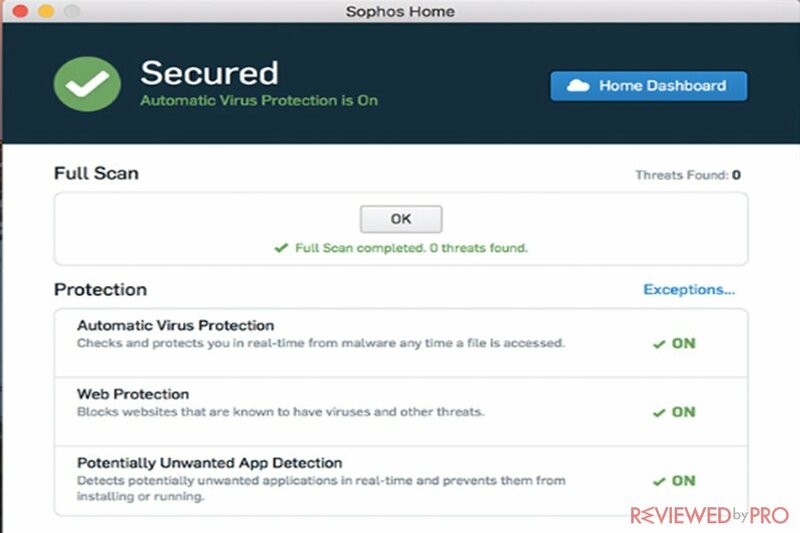 Sophos Antivirus for Mac Home Edition offers users a very simple, bight and easy user interface, which is also easy to understand and navigate. Sophos Antivirus for Mac Home Edition is a great choice for those who want to protect their family without spending any money, as it provides a decent set of security and privacy features together with a decent malware detection. The advantages of the application are easy to understand and simple interface, system scans that can be performed within a single click, additional features, including useful parental controls. However, malware detection is far from perfect. If you want to protect your entire family’s devices for free, then Sophos Antivirus for Mac Home Edition would be a great choice, as it delivers decent antivirus protection and a decent set of security and privacy features. However, if you are looking for a superior malware detection and removal rates, along with a very decent feature set, then we would recommend you Bitdefender Antivirus for Mac. The antivirus package demonstrates excellent malware protection, advanced features, and anti-ransomware protection. Olivia Morelli is a senior media writer on Reviewedbypro.com. Her favorite topic to write about is ransomware attacks and how to deal with them, but she also enjoys covering the topics of other types of malware and VPNs. ^ Bitdefender Antivirus for Mac. Bitdefender. ^ Sophos Antivirus for Mac Home Edition. Sophos. This entry was posted on 2018-04-17 at 08:29 and is filed under Security. © 2019 Reviewedbypro.com. All Rights Reserved. Partial or full use of information without the express written permission is prohibited. Supported by esolutions.lt.